Watch the paparazzi start to follow you when you start wearing head turning slim fit dinner jackets by Tazio menswear. These slim fit style blazers have that ready to pose for the camera style that you see all the Celebs wearing on the red carpet. 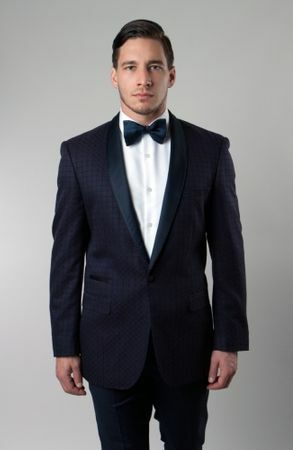 This Tuxedo style dinner jacket is made of a rich blue and burgundy fabric with a chain like pattern on it and has side vents in the back. Slim fit.